A college student and member of the Ashcombe Volleyball Club, Grimson is coached Alan Thompson. Grimson was an All-English Beach Volleyball champion in 2006 and 2007. 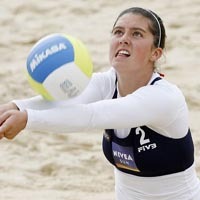 She was also the U16 and U18 British Beach Volleyball Champion.